Inside: Being a happy mom really isn’t rocket science. But why does it feel so impossible at times? 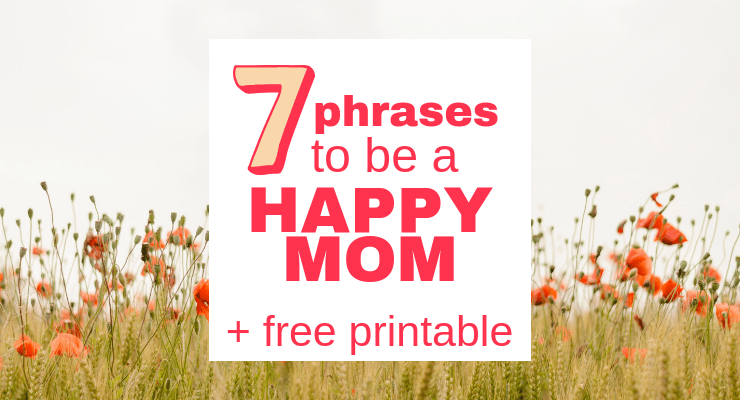 Keep reading to learn seven phrases that will help you center and choose to be a happy mom, one day at a time. Grab the free printable and stick in on your mirror or fridge to remind yourself of these powerful truths! I have this picture on my fridge. 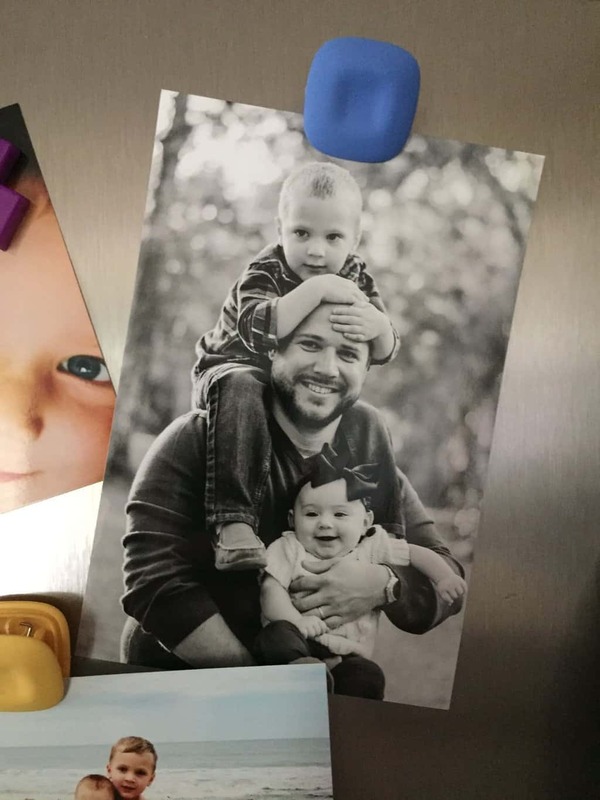 Every time I fill a sippy cup or grab a snack I look at that photo. And no matter what, it makes me feel happy. I feel that warm, heavy rush of happiness flood through my soul. It’s a happiness that’s born out of the years I prayed and cried for the boy on his daddy’s shoulders. It’s a happiness that bursts with pride at the potential waiting inside that baby girl. It’s a happiness that’s grown year after year as I watch that man grow in grace and walk with integrity. They really exist. They’re out there, in the grocery store, at the park, in your church. They’re real. And yet everywhere we look, we get images of the opposite. We watch shows where the mom is overwhelmed, a second class citizen to her kids, or just plain angry. We hear stories about moms who are just overrun, depressed, and exhausted. Hey, at times we are that unhappy mom. And that’s OK.
Do you know what He did write down? His plan for your motherhood is not to overwhelm you, but to walk side by side with you through the overwhelm. He wants real, deep joy for you. Right now. Right where you’re at. 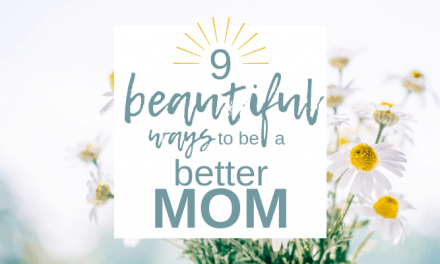 Being a happy mom isn’t impossible, and it’s not rocket science. But it does begin at a deeper level than many are willing to dig. Counting to ten, taking deep breaths, all of these things are beneficial and useful, but they don’t scratch down to that real place where joy and sorrow live. When we become unhappy, we usually look one place. In. You can be a happy mom. Are these quick fixes? No. But will they work as you apply them bit by bit over time? Yes! These seven helpful phrases will guide you into looking up toward Jesus for your happiness. 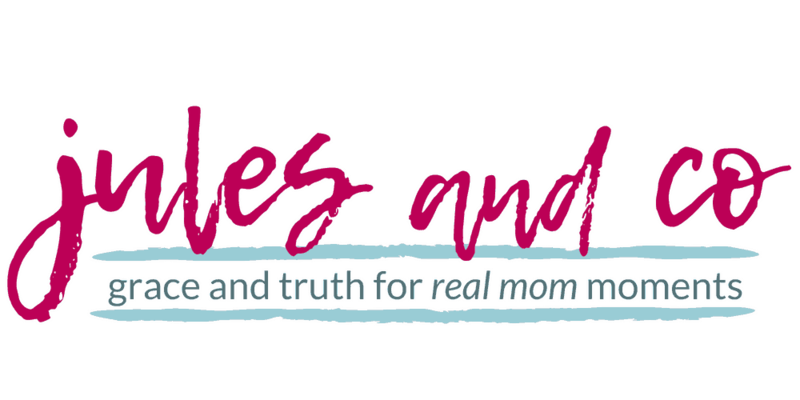 Being a happy mom starts with acknowledging who you are and whose you are, and bringing your emotions in line with those truths. Phrase #1: I’m not enough, but Jesus is. I’ll be honest. We’ve all been lied to. Over and over, we hear messages that say “you are enough.” So then we strive and strive in our “enough-ness” for happiness, joy, and fulfillment. Then when we fall miserably short (as we most certainly will) we get even more discouraged than we were to begin with. The simple answer is that you are not enough. You never will be. A happy mom has come to terms with this, she’s done striving for perfection. Christ calls us to progress. Phrase #2: I will choose discipline now instead of chaos later. The truth is that discipline is often a dirty word. But discipline, when applied consistently, will transform your life mama. It simply means doing the hard work now so you don’t have to do the worse work later. The hard work of leading a disciplined life is still infinitely more easy than cleaning up a chaotic, undisciplined life. Happy moms know this. They’ve learned to put in the hard work first, and reap the rewards later. And they feel real joy because they know their work is worthwhile. 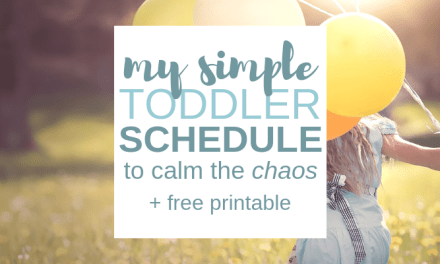 Related Reading: Clever Solutions to Create a Kids Schedule that Works! Phrase #3: I can find tiny moments of joy in every day. When you have a bad day, you suddenly become a generalist. Everything is going wrong. Everyone is doing wrong. It’s all bad. But happy moms know how to find moments of joy even on those bad days. It’s not all bad. So I sent my child to his room to rest. I figured a good nap usually fixes everything. A while later I went in to wake him up. As I saw my son snuggled there I couldn’t help but think that he wasn’t a baby anymore, and he’s grown so tall and strong. He’s independent, and fierce, and compassionate, and needy, all at the same time. I squeezed in next to him on the bed and looked at his face. At the remnants of his chubby baby cheeks. At his eyelashes sweeping down over those eyes that had looked so angrily at me moments before. Phrase #4: I will offer others what I have, not what I wish I had. Why is it that so much of unhappiness is born out of wishing for what we don’t have and wishing we didn’t have what we do have? The same holds true when we think of our gifts and abilities. As moms, we can get caught up in comparison. 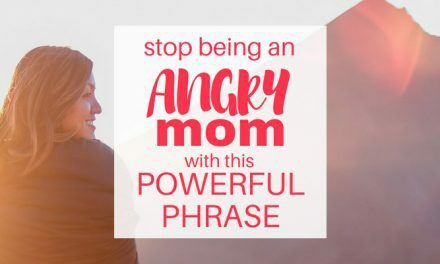 But if you want to be a happy mom, you can learn how to use the abilities you do have with confidence. A sure plan to find happiness is to use the gifts God gives to you to help others. Don’t keep them to yourself, there’s no joy in that! If you’re good at writing… write to encourage others. If you’re good at baking… open up your kitchen to those in need. If you’re good at organizing… help someone declutter their space and life. Happy moms use what they have to help others. If you want to be happy, be a giver. Become content with being a vessel of whatever gifts God pours into you. Phrase #5: I can choose gentleness and kindness, no matter what. Nothing steals away happiness like a hot temper. My son loves to help me make dinner, it’s one of our favorite times to spend together. It brings me happiness to be able to teach him and just be with him while we cook. But then he stirs a little too fast, and the flour explodes out of the bowl. The harsh words instantly deflate the happiness in the room. Instead, what if I chose a gentle word to correct? What if I chose to show kindness and make allowance for the fact that he’s four, and the bowl is big, his hands are small, and goodness isn’t he just trying to help after all? Happy moms can do better with the help of the Holy Spirit. I can do better, and so can you! Phrase #6: I will be a friend to make a friend. Happy moms know they can’t live without friendship. And they’re bold enough to make it happen. Isolation is fuel for unhappiness in motherhood. So what can you do to combat it? It’s incredibly simple, but I’ll warn you, it takes courage. The mom on the park bench? She needs friends too. Why not invest in your happiness and her happiness by making the first move towards friendship? Phrase #7: I will choose relationships over things. Where you spend your time reveals what you value most. Happy moms spend their time cultivating relationships. But sometimes things can sneak in and steal our happiness. When we spend all our time stressing over clutter. That steals our happiness. When we worry over having more this or better that. It steals our happiness. When we choose things over relationships, even if it’s subconscious, we give away our happiness. That clutter? Get rid of it! You’ll be a happier mom. Did this post encourage you? You’ll want to keep these phrases where you can see them everyday! 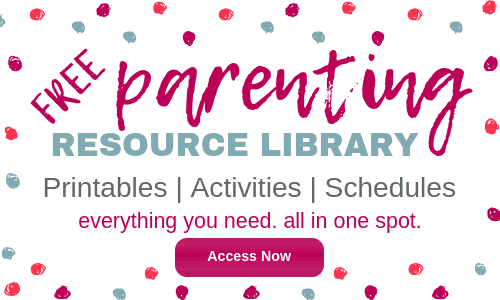 Click the image below to access our free parenting resource library. 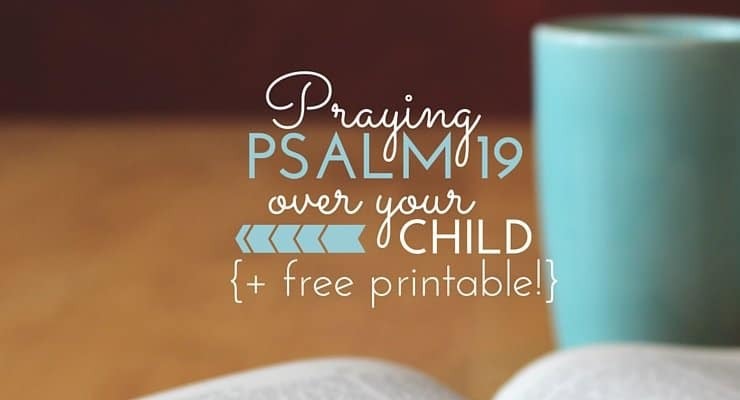 You’ll be able to download tons of helpful printables, all in one spot! 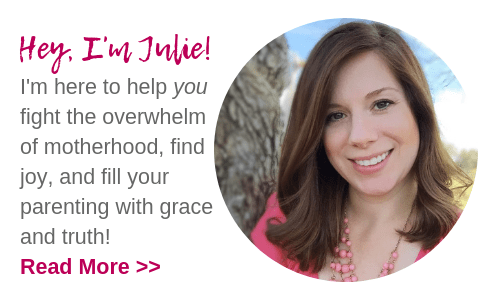 Feeling unhappy in your motherhood? Overwhelmed or discouraged? These aren’t quick fixes. Being an unhappy mom isn’t just a surface issue. Finding real happiness takes time and a continual habit of making a choice to be joyful. But it’s not rocket science. With God’s help, you can be a happier mom, starting right now. 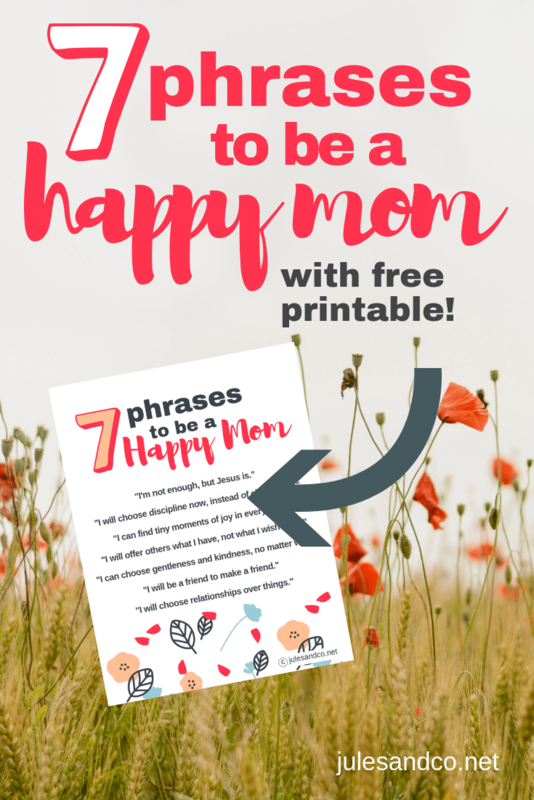 Tell me how these powerful phrases are helping you find joy and be a happier mom! Thank you for these thoughts to live by. Live and grow and make a difference in the world!